It is an honour to be invited to give the Alan Bernstein Distinguished Lecture. Bernstein was the founding president of the Canadian Institutes for Health Research and Executive Director of the Global HIV Vaccine Enterprise. In honour of his achievements, the UBC James Hogg Research Centre established the Alan Bernstein Distinguished Lecture as an annual celebration of scientific excellence. Speaking as UBC’s president and also as a faculty member in the Faculty of Medicine, I feel inspired by Dr. Bernstein’s leadership in mentoring generations of medical students. Today I’d like to talk about UBC’s Faculty of Medicine, of which I am a proud faculty member. UBC’s Faculty of Medicine ranks among the world’s best, and is a leader in both the science and the practice of medicine. Next year marks 70 years since the Faculty opened its doors in 1950 with 60 students. In 2018, we celebrated the 10th anniversary of the first cohort to graduate from our very successful distributed medical education program. 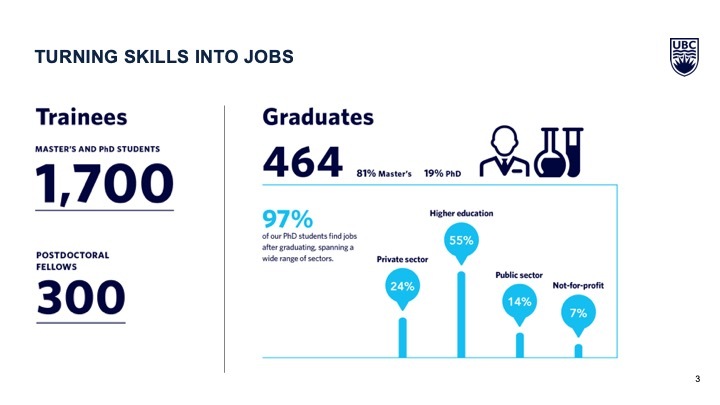 More than a third of our nearly 300 MD graduates were educated and trained outside Vancouver, in classrooms, hospitals and clinics around B.C. The past 70 years have seen remarkable progress. Today, UBC Medicine ranks among the world’s top medical schools, with the fifth-largest MD enrollment in North America. The next 70 years promise to be just as amazing. The Faculty has developed a provincial network of more than 80 training sites to support the expansion of the MD program – Canada’s first fully-distributed undergraduate medical program. UBC Medicine is a global leader in distributed education, providing educational and research programs through an integrated and province-wide delivery model. Students receive educational experiences in urban, regional, community and remote settings. We are working to build a medical community that fully supports the rich diversity of people who live in B.C. In 2017, we celebrated the 15th anniversary of the Indigenous MD Admission program. Since the creation of the program, more than 80 Indigenous students have graduated, serving as doctors in communities across B.C. and Canada. Last year, we launched Canada’s first Certificate and Graduate Certificate in Indigenous Public Health. We also formed an Indigenous Health Advisory Council to advise on education, research and clinical innovation. Year after year, research excellence in the Faculty of Medicine is supported by investment from funding sources here at home and around the globe. We are grateful for these essential investments. 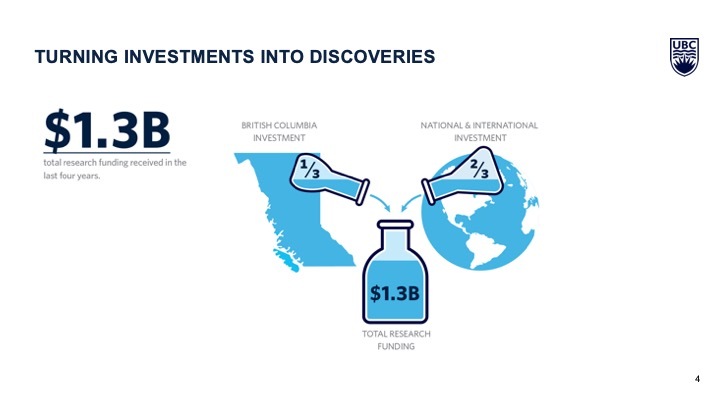 They ignite research innovation and discovery, and fuel economic growth and prosperity across the province. Last year, Medicine received over $350 Million in research support that will propel research in core areas of critical importance. These include an astonishing $101 million from Genome Canada for genomics-based research projects led or co-led by members of the Faculty, as well as $43 million awarded to 47 Faculty members through the Canadian Institutes for Health Research’s Project Grant competition. One example of innovation — Claudia Krebs, Professor of Teaching, Department of Cellular and Physiological Sciences. In partnership with Microsoft, her team developed a new, interactive teaching tool using the Microsoft HoloLens. It uses virtual reality and holograms to help students visualize the brain’s three-dimensional structure. There are many more examples like these, thanks to our amazing faculty and innovative partnerships. From discoveries to patents, the Faculty of Medicine is driving innovation to accelerate the transfer of knowledge to care. 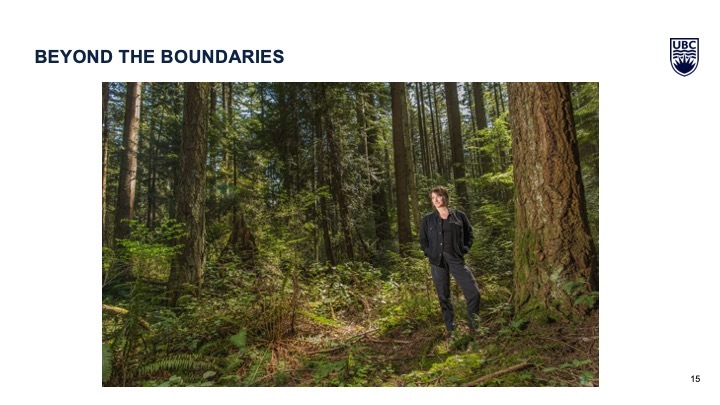 The Faculty has an incredible opportunity to engage with the university’s new strategic plan, Shaping UBC’s Next Century, through inclusion, collaboration and innovation. 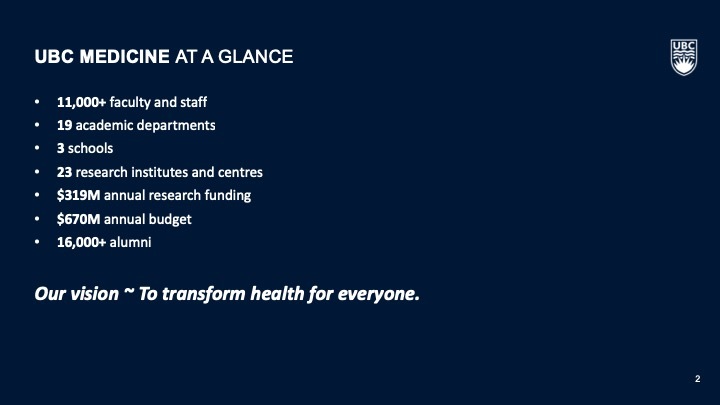 We also have the opportunity to work with our partners here at home and around the world to solve our most urgent challenges and transform health for everyone. 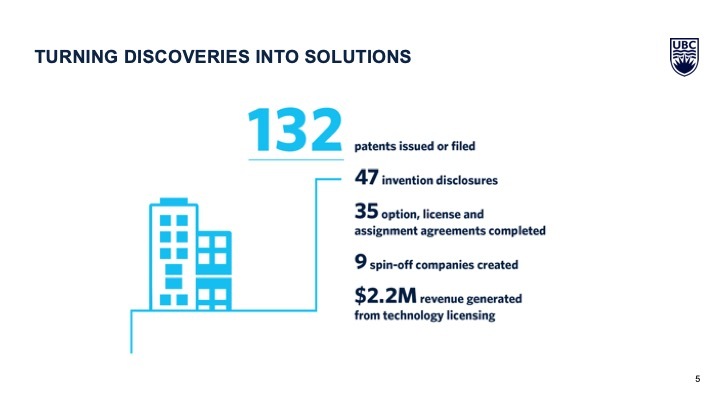 Facilitating innovation, commercialization and industry partnership and investment. 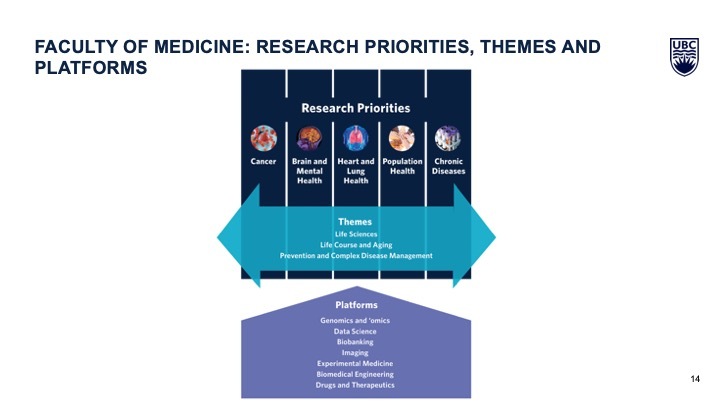 One area of focus is translational medicine. Translational medicine builds on basic research advances — studies of biological processes using cell cultures, for example, or animal models — and uses them to develop new therapies or medical procedures. More comprehensive definitions address issues of dissemination and uptake of science – the late stage translation concept. 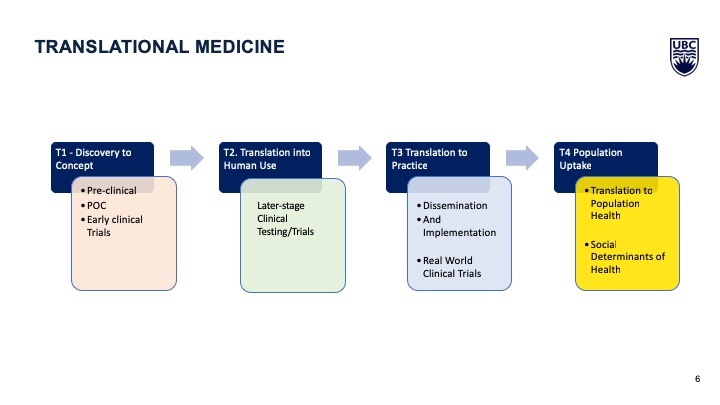 There are four stages of translational medicine — discovery to concept, translation into human use, translation to practice, and population uptake. I’m going to provide just a few examples of translational medicine initiatives at UBC. One example: The Personalized Oncogenomics Program. It’s a province-wide initiative led by UBC’s Janessa Laskin and Marco Marra that uses DNA sequencing technologies to examine the composition of individual cancer genomes and to help deduce the most viable treatment options for patients. Funded by the BC Cancer Foundation, the POG Program has grown from examining one case a month to almost one case a day. The UBC BC Cancer Agency Research Ethics Board recently approved the study of 5,000 cases and new Canada Foundation for Innovation funding will allow the program to sequence over 10,000 genomes a year. 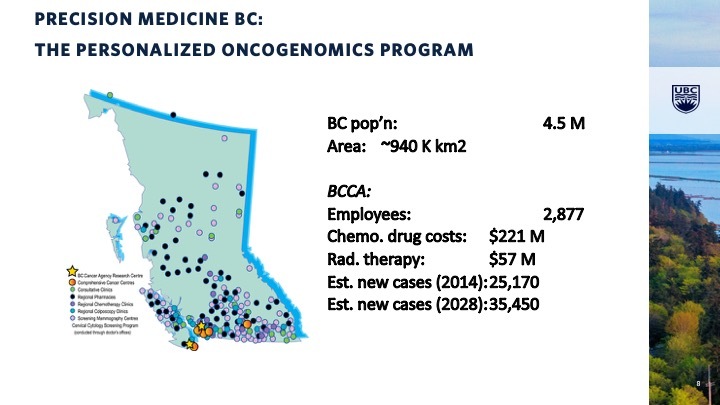 As B.C.’s population grows and ages, the incidence of cancer is expected to increase rapidly, making the POG Program an increasingly important player in the advancement of cancer treatment in both our province and beyond. 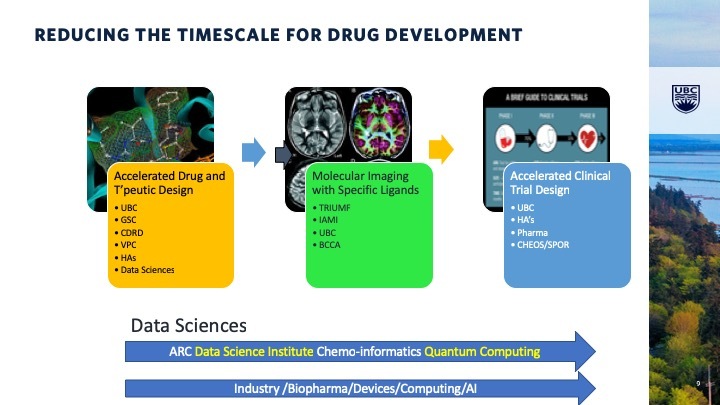 We’re also working with other institutions on reducing the timescale for drug development. Biomedical engineering is another important area for UBC. That’s why we established the School for Biomedical Engineering – a collaboration between the Faculty of Medicine and the Faculty of Applied Science. Biomedical Engineering fuses engineering, medicine, life sciences, computer science, and mathematics to address fundamental and translational problems that impact human health. 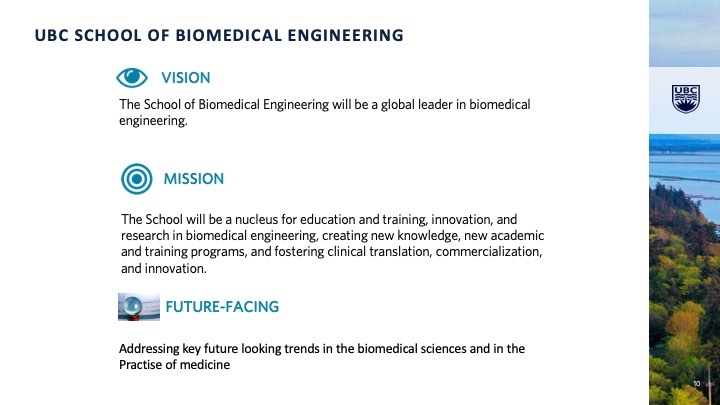 An aging population, advances in biomedical technology, significant increase of cellular and molecular data, opportunities in precision medicine, and increased complexity and cost of healthcare delivery – these are some of the factors fueling the growth in biomedical engineering. It’s an exciting time for this emerging field. Last fall, we welcomed the School of Biomedical Engineering’s inaugural cohort of undergraduate students. 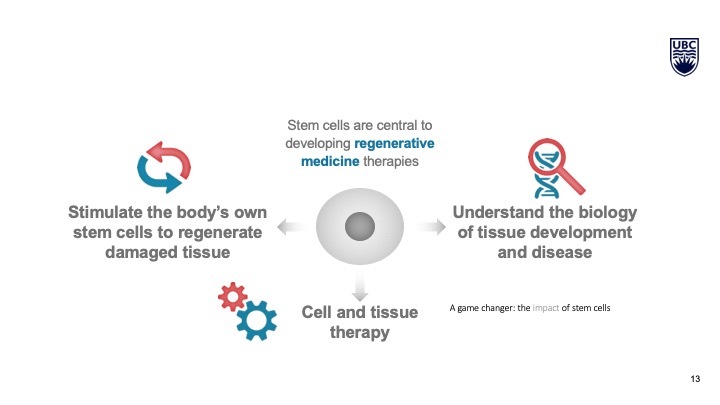 Regenerative Medicine is another example. Peter Zandstra is the director of the School of Biomedical Engineering. He’s also a leader in the field of regenerative medicine and he and his colleagues are working with stem cells to develop regenerative medicine therapies. 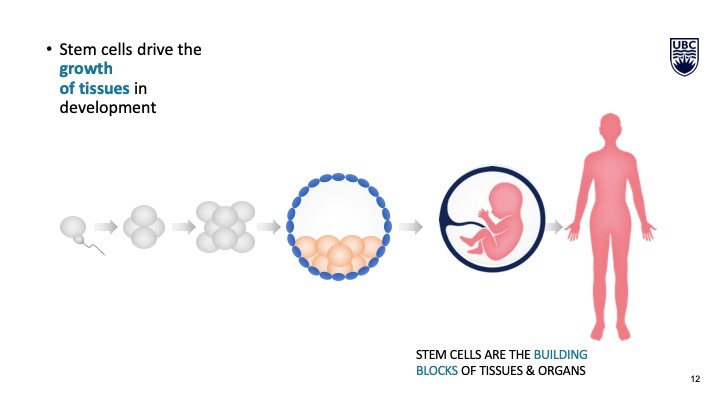 The potential for stem cells is huge – but this is only one of the areas of research we’re working on in the Facuty of Medicine. And I say “we” deliberately, as I’m a faculty member and researcher in the Faculty as well. My own area of research encompasses the immune system, eye inflammation and age-related macular degeneration – a leading cause of blindness. The Faculty’s research environment is remarkable for its depth and breadth in core areas of critical importance to human disease. accelerate the transfer of research to care. The goal is knowledge creation, translation and exchange, to improve outcomes for patient and public health. Achieving this goal will depend in part on taking UBC research directly out into the community. For example, Pat Camp in the Department of Physical Therapy is working with Carrier Sekani Family Services to conduct community-based lung health research for Indigenous populations. Carrier Sekani Family Services is an organization serving the health and wellness of communities dotted throughout a vast territory, stretching nearly 76,000 square kilometres across north central B.C. Pat is a physical therapist who works at the St. Paul’s Hospital Pulmonary Rehabilitation Clinic. She has dedicated her career to helping people living with chronic lung disease — including those with chronic obstructive pulmonary disease. Over the next five years, she will be working alongside the CSFS team, as well as community members, to assess the prevalence of COPD in the region, and the feasibility of creating a pulmonary tele-rehabilitation program, what could become the first of its kind in the province. Technology is an ever-expanding part of innovation in health care. 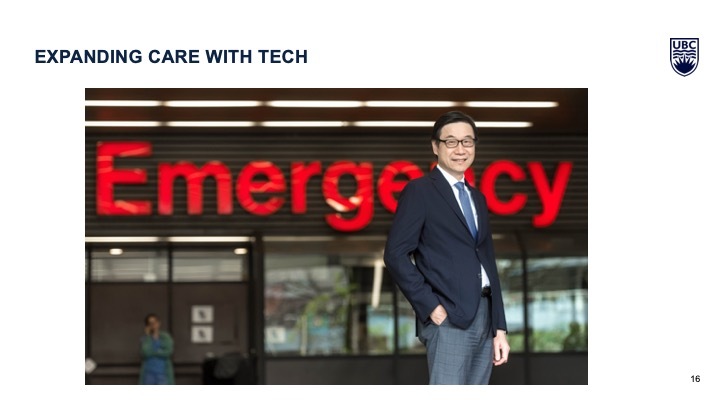 Kendall Ho in the Department of Emergency Medicine is advancing our understanding of how technology can improve care delivery for patients with chronic heart failure. Kendall noticed that emergency departments seemed like revolving doors for people with heart disease. About one in four people with chronic heart failure were being re-admitted within a month of being discharged, and about four in 10 are being re-admitted within three months. Kendall has come up with a way to reduce the revolving door syndrome using technology — he calls it TEC4Home. After the patient comes home from their initial hospital stay, a technician pays a visit and sets up devices for measuring weight, blood pressure, blood-oxygen levels and heart rate. Patients are also given a tablet to answer daily questions about their condition. The information is funneled to a nurse, who scans it and flags cases that require intervention. A 2017 pilot project with patients in Vancouver and Kelowna identified several cases where intervention helped avoid re-hospitalization. Now, working in collaboration with Interior Health, Fraser Health and Vancouver Coastal Health, TEC4Home is expanding to at least 18 communities in the Interior, Fraser Valley and Metro Vancouver. The goal is to compare the outcomes of patients who are remotely monitored with those who are not. Here’s another example of how the latest technology can translate investment into impact. Tillie-Louise Hackett, Associate Professor in the Department of Anesthesiology, Pharmacology and Therapeutics, has published a research study that raised alarm about the early impact of chronic obstructive pulmonary disease – or COPD – on lungs. The study finds that permanent lung damage caused by COPD starts much earlier than previously thought. The discovery could dramatically change how patients are treated for COPD, which is the leading cause of hospital admissions in Canada. The researchers found that patients diagnosed with even mild COPD have already lost a significant portion of their small airways — an average of more than 40 per cent. 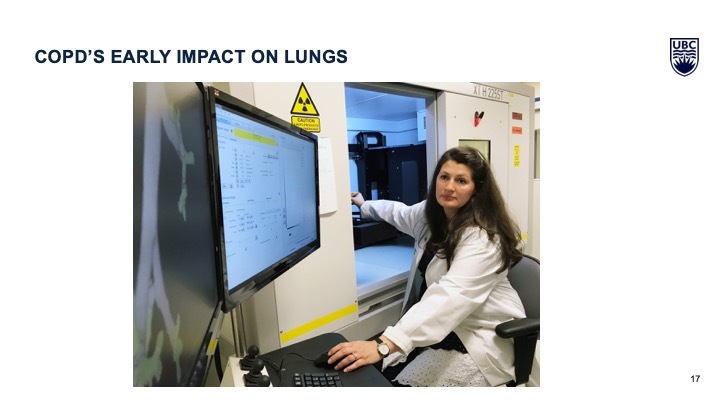 Lung samples from 34 patients were analyzed using an ultra-high resolution microCT scanner. This is one of only three scanners of this kind in the country. We are grateful to the Canada Foundation for Innovation and the St. Paul’s Foundation for providing the funding. The HLI Lung Tissue Registry Biobank at St. Paul’s has been collecting specimens for more than 30 years, but the microCT scanner made it possible to image samples that are embedded in paraffin in extreme detail. And of course, heart research is very important to UBC’s Faculty of Medicine. 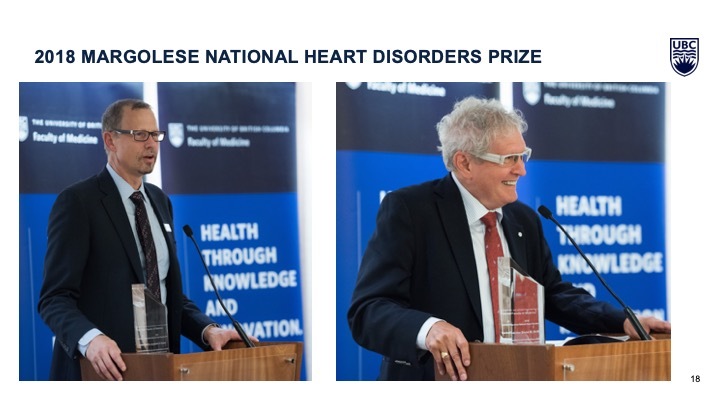 I’m proud to recognize two UBC Medicine faculty, who were co-recipients of the 2018 Margolese National Heart Disorders Prize. On the left is Andrew Krahn, Professor and Head of the Division of Cardiology, who received the prize for his work on detecting and managing heart rhythm disorders. On the right is Bruce McManus,Professor, Department of Pathology and Laboratory. He received the prize for parlaying his insights into inflammatory heart and vascular diseases and transplant vascular disease, into the development of diagnostic or predictor biomarkers for heart, lung and kidney failure. In closing, as British Columbia’s only Faculty of Medicine, UBC Medicine is rising to the challenge of training the next generation of health professionals and researchers in a system that is evolving in real-time, generating new knowledge in response to urgent issues such as aging and chronic illness, and developing new models of partnership and collaboration to ensure our health system is accessible, effective and . On a personal note, I’d like to once more say how honoured I am to be here. My own experiences have made me very aware of how the boldest of dreams can only be achieved by working together, in medicine and health care, and in all aspects of our lives.